and i think the super-deformed works just fine. finally! a little bit o’ GENIUS! GAH! my frst comment was lost! anyways sorry for the belated post ive not been online much. i still think the sketch is a little messy, but this time not in its sketchiness, but rather in the sketchy quality juxtaposed against the still rather tight and illustrative execution of the colors. free up your colors, leaning in the direction of the impressionistic, and u’ll nail it! eh, at least ur experimenting and growing. and the thought process of each post is becoming clearer each time, which is good. the process is not important in illustration or advertising, but it is in every other area of art. of course, it’s up to u whether or not it’s important to YOU. i prefer seeing the process since i love drawing so much. but it’s an aesthetic learned. 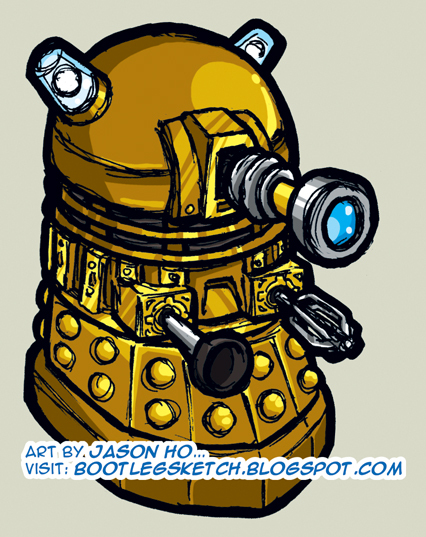 i knew IMMEDIATELY it was a dalek. now draw the tripods from the War of the Worlds! ren: glad you like it–the original version is a super-secret marketing weapon that is only to be posted when the time is right!